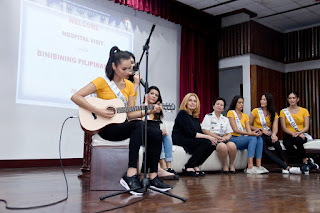 A number of brave wounded soldiers confined at the Armed Forces of the Philippines Medical Center along V. Luna Avenue, Quezon City spent a happy afternoon with the Binibining Pilipinas 2017 Queens as the lovely ladies dropped by for a visit on July 20, 2017. What made the visit extra special was the fact that BPCI Chairperson Mrs. Stella Marquez-Araneta graced the event along with the Queens. BPCI has long been a proponent of these types of charity events, and this one was held in partnership with Makati Medical Center Foundation. Mrs. Araneta took time out of her full schedule to accompany reigning Queens Miss Universe Philippines Rachel Peters, Binibining Pilipinas International Mariel De Leon, Binibining Pilipinas Intercontinental Katarina Rodriguez, Binibining Pilipinas Globe Nelda Ibe, Binibining Pilipinas Grand International Elizabeth Clenci, and Binibining Pilipinas Supranational Chanel Olive Thomas. The Queens more than welcomed the opportunity to meet the valiant men in uniform, as well as gave them reasons to smile – their presence was clearly appreciated by the soldiers, as were the tokens they brought with them. Mrs. Araneta opened the program with a few words for the wounded soldiers. She acknowledged the perils of their sacrifice for the greater good. “You encountered a lot of bad things on the battlefield, and you had to fight for the country,” she noted, adding that the hospital visit is their small way of expressing gratitude for the men’s courage and heroism. Mariel De Leon sang a sweet rendition of the classic Elvis Presley tune “Can’t Help Falling in Love with You,” accompanied by Elizabeth Clenci on guitar. The spellbound audience requested for another song, and the two Queens gladly acquiesced. After the performance, Elizabeth said, “It's incredibly inspiring and at the same time heart wrenching just to see what these soldiers have been through.” She added, “(I think) that’s the main part of being a Beauty Queen, the heart behind it all." The real highlight of the event came after the short program, when Mrs. Araneta and the Queens did their rounds in the hospital, and stayed for some time at the Heroes’ Ward. The Beauties turned heads as they walked past the crowd, and lit up each room they entered with their genuine warmth. BPCI put a smile on over 200 wounded soldiers’ faces as the Queens and Mrs. Araneta handed the recovering patients some gifts, and gave heartwarming, encouraging words for their speedy recovery. Rachel even shed some tears while doing their rounds. Recognizing the harrowing experiences of the soldiers, she took the chance to thank the brave men, saying, “Thank you to all of these guys for sacrificing their lives for our country, for the safety of our kababayans in Mindanao. So much love for all of you." Sergeant Sergie Benitez of the Philippine Marines, wounded while in contact with Maute rebels, said the Beauties’ visit lifted their spirits. "Tumaas ang morale namin kasi binisita nila kami, nakita nila 'yung suporta nila sa amin," he said. Mariel expressed her views on what motivates aspiring Beauty Queens, “This is why girls join pageants, to actually give back.” According to her, pageants have gone beyond highlighting just looks or beauty; she believes what has also become important is the fact that reigning Queens can use their influence to help and inspire others. Seeing the happy faces of the men they visited, one understands the value of these seemingly simple encounters. You can’t put a price on positive influence; and on making our tired and wounded servicemen feel their efforts are not taken for granted. For more News on Binibining Pilipinas, explore the www.bbpilipinas.com website, and visit the Binibining Pilipinas official Facebook page at https://www.facebook.com/realbbpilipinas.